My voluntary job at the moment consist of walking, working in a forest, I walk a lot every day, couldn't do without it. Seems most people today can barely walk the length of themselves though; wouldn't even walk round the corner to the shop. I'd really love to be able to climb hills, mountains, walk country roads do a tour like Keats and Brown; sadly don't have my own Brown, someone able, and mad enough to do it with me. I've often wished that Micahel Palin, or even the historian, Michael Wood might make a TV show along the lines of 'In the footstep of Keats' retracing his trek around the highlands over to Ireland etc. Saturn wrote: I'd really love to be able to climb hills, mountains, walk country roads do a tour like Keats and Brown; sadly don't have my own Brown, someone able, and mad enough to do it with me. It was a phenomenal distance they covered! I'd love to see a TV show on it, too. Brown gets a bad press (particularly in Bright Star) doesn't he? But it's great Keats had that friendship for those months or short years. 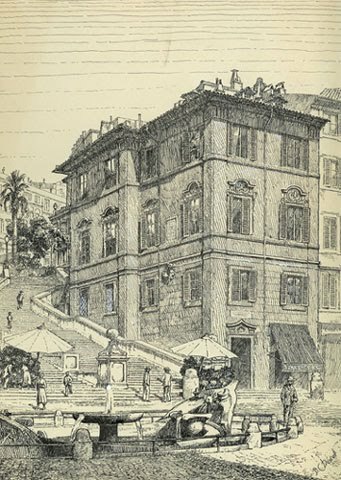 I can totally understand Brown being criticised for not accompanying Keats to Italy, but I don't think the reasons were only selfish; he seemed unwilling or unable to accept that Keats's health was deteriorating, almost psychologically unable to confront the prospect of loss. Yet there is something charming about their friendship for the most part. I'm re-reading the Plumly book on my last day off. It really is good. Now reading 'In the shadow of the sword' by Tom Holland about the end of classical antiquity, the rise of the Islamic faith and the response of the two great empires of Persia and Rome's response to it. Gripping and surprising as all of Holland's previous books, this one perhaps more so because it's a subject and a period of history so little known beyond specialists in the west. Jesus, heavy reading for a Sunday night! I hadn't heard of that, thanks Cath, looks interesting. Now ploughing my way through a very large volume of Plutarch's Lives as translated by Dryden and others. Wow - good luck Saturn. You are remarkable in your range of reading. I'm currently reading Paul O' Keeffe's A Genius for Failure: The Life of Benjamin Robert Haydon ... and am quite liking it so far. Or rather, I'm enjoying learning more about Haydon's life . whenever I can, great walks there. Nice to get out of the city for a while. Never got to see Danny Boyle's acclaimed play with Jonny Lee Miler and Benedict Cumberbatch, so this is the closest I'll get. It's an interesting take on the novel, which excises a great deal of the extraneous plot and characters and owes much I think to Kenneth Branagh's 1994 film, which some may balk at but to me is a positive boon. The creature is very much to the fore here and is the most sympathetic character and Frankenstein here is a somewhat cold, distant, emotionless figure, which suits this adaptation I'm sure but is not really fair to the character in the novel. It is he, and he alone who is the monster, and the abomination who won't give Elizabeth children, who blames his father for William's death. Very interesting, if short adaptation. I'm sure it works better on stage in the hands of two great actors, swapping roles. I must say Genius for Failure wasn't my favourite read. I found the writing rather dull and pedestrian and the illustrations shockingly badly printed. Nevertheless having shelled out I dutifully plodded through to the (gruesome) end. I can't help feeling frustrated that the greatest Romantic poet - John Keats - and the greatest Romantic painter - John Constable - didn't bump into each other on Hampstead Heath where they were both living at around the same time. Constable's earliest glorious cloud studies date from around 1821 but I can't help but feel he must have been au fait with the area before moving in. Those sonnets were wasted on Haydon! Plumly has actually written(and has recorded) a poem about this very subject: Keats, the Heath, Constable and his cloud painting(s), and how if Keats had lived just a little longer, the two may actually have met (so, so many "what if's" in Keats's short life . . . ). You can hear Plumly's recitation (but the text isn't shown) if you go to www.poets.org. Type in Plumly's name and the title of the poem is "Constable's Clouds, for Keats." Wow. Thanks for this Ennis. Off to read this.